Playworks Massachusetts supports learning and physical health by providing safe and inclusive play to low-income students in urban schools. 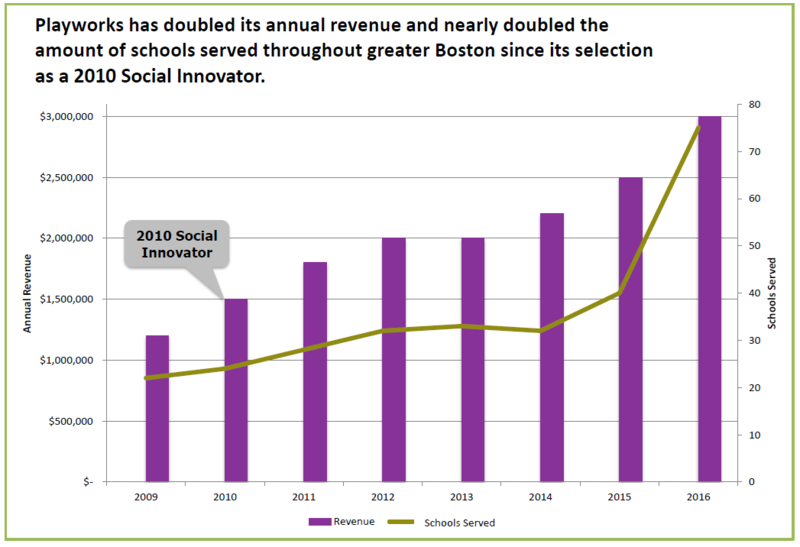 When Playworks joined the 2010 Social Innovator cohort, the organization had annual revenues of $1.2 million and ran programs at 22 schools in the greater Boston area, serving 14,000 children. An experienced leader who was committed to creating positive impact in his community, Executive Director Max Fripp knew he needed support to solidify the organization’s financial sustainability, strengthen its messaging and communications, and increase its scale to reach more students in need. Working with an SIF consultant, the Playworks Massachusetts team created streamlined ways to communicate the organization’s impact in greater Boston and articulate its mission, vision, and value proposition to potential investors, including an audience of over 300 people at the 2010 Social Innovator Showcase. With the help of his consultant, Max created a plan to deepen Playworks’ relationship with the Boston Public Schools. He was also able to think more broadly about the larger region, creating strategies to reach and engage communities beyond the school districts where Playworks had established programs. With the help of SIF, Playworks Massachusetts recruited a development manager in order to enhance fundraising strategies and expand Playworks’ funding network – a top priority to achieve financial sustainability. Jonathan Gay began his work at Playworks Massachusetts as a coach and became the first development manager, learning what it took to make the organization grow and expand efficiently. By utilizing SIF’s network throughout greater Boston, the Playworks Massachusetts team has been able to double their number of corporate funders and foundation supporters between 2010 and 2016. We have been able to capitalize on marketing ourselves as a Social Innovator and as a part of the Social Innovation Forum. As a regional branch of a national organization, Playworks Massachusetts was unusual among SIF innovators. The new policies, strategies, and materials that Playworks Massachusetts developed through its time with SIF influenced the Playworks national organization as well. A three-part message developed with SIF – Stop the Chaos, Shift Behaviors, Accelerate Learning & Health – stuck both regionally and nationally, creating a cohesive message throughout the organization that is still used today. Utilizing Playworks Massachusetts’ strategy on geographic diversification, all branches are now being encouraged to reach schools outside of their current school districts and think more broadly about the larger community in order to reach more youth and create more impact. Although Jonathan Gay was the first regional development staff person, now every branch across the country is encouraged to hire local development staff. “Since working with the Social Innovation Forum, we have hit our fundraising target each year and we are the first city in our network to achieve local sustainability,” said Max Fripp. In 2016, Jonathan Gay transitioned from Director of Partnerships and Development to Executive Director. Under his leadership, Playworks is changing the lives of more than 25,000 students throughout Massachusetts every school day. Playworks is also recognized as a leader in advocating for city- and state-wide child health and wellness policies, and its model has been cited by The Boston Foundation as a best practice for increasing daily physical activity in its Healthy People/Healthy Economy report. Additionally, based on Playworks’ recommendation, Boston Public Schools, the largest school district in New England, included recess into its revised wellness policy. Six years after Playworks was chosen as a Social Innovator, its relationship with SIF continues. 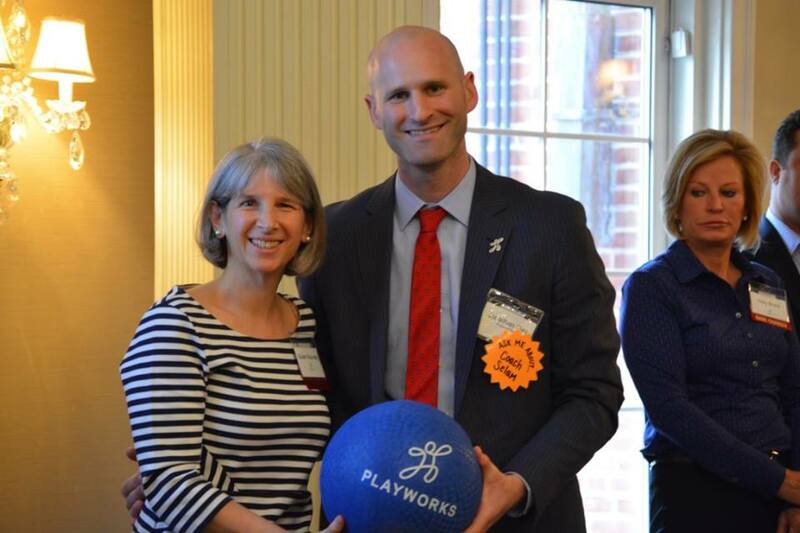 As Playworks Massachusetts celebrated ten years of success in 2016, the organization recognized SIF as one of 10 “GameChangers” who have supported and promoted the Playworks mission in Massachusetts. Playworks also recognized Larry Stifler and Mary McFadden of the Stifler Family Foundation as GameChangers. Larry and Mary, who met Playworks through SIF in their role a track partner in 2010, engaged deeply with the organization, acting as critical sounding boards and supporters during Playworks’ time in the Social Innovator Accelerator and in the years that followed. With programs running in more than 40 schools, Playworks continues to practice the “Power of Play” and improve the lives of youth across the Commonwealth.